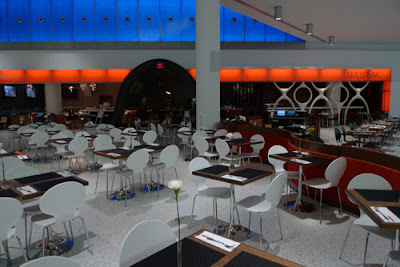 Terminal 5 at New York JFK airport my favorite part of the almost one year old facility is the T5 version of Take out with delivery. 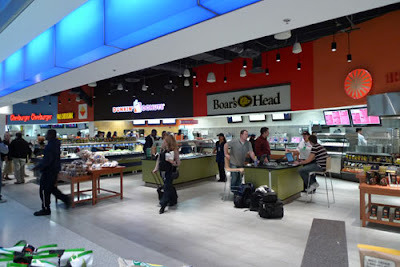 Since so many travelers are known to arrive early at the airport and remain seated at their gates until departure, JetBlue's food and beverage concession partner (OTG Management) came up with a remote food ordering systems in the gate areas! They named it Re:vive. These touch-screen monitors let travelers order meals that are delivered directly to their gate-side tables, so they can be near their gates and do not miss any important announcements or boarding calls. 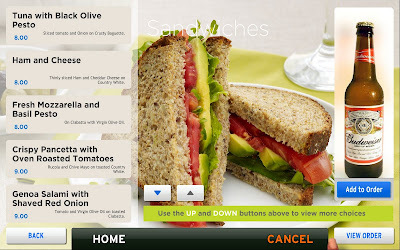 There are 220 Re:vive touch screens located throughout T5 offering over 30 food items with prices ranging from $8 - $15. Plus, the best part, all orders arrive to you in 10 minutes or less. Amazing. 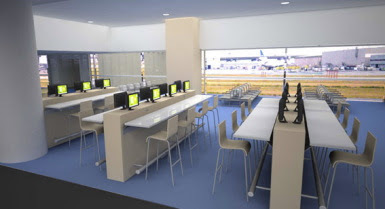 OTG Management said Re:vive is "unique to JetBlue and T5 and were conceived as a way to offer customers a convenient dining option at the gate". So this means I get to blog from the gate, and if I'm hungry I don't even have to leave my seat. Yikes! This could be dangerous. Who knows, maybe JetBlue is practicing in their terminal what it plans to eventually offer in-flight. Wouldn't that be awesome! For more reasons why you should choose JetBlue for you next flight, see my "Top 10 Reasons Why I Love JetBlue". 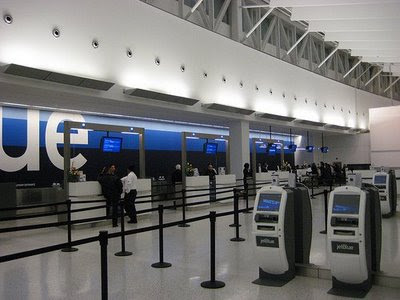 On a side note, congratulations to JetBlue as they celebrates the 1 year anniversary of T5's opening, on October 22nd! 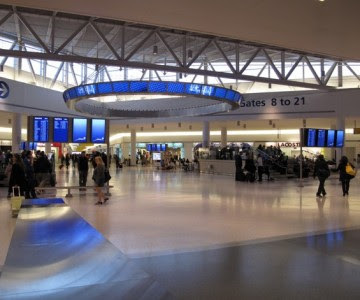 To honor T5, here are some pictures of the terminal.